Located between Beaune and Volnay, the Pommard appellation with its Climats and beautiful stately homes marks the spot where the Côte turns slightly towards Autun. Long ago, all the land belonged to the Dukes of Bourgogne, religious establishments like the Abbey of Cîteaux, and old families like the Marey-Monges. In the Middle Ages, Pommard was thought of as the “flower of Beaune wines”. It is a wine of reference, and exclusively red from the Pinot Noir grape. But one must be wary of preconceived ideas: Pommard’s celebrity in the 19th century earned it the image of a forceful, virile wine. In reality, terroir, vinification, and ageing bring more nuance, resulting in a wine that is rich and complex. Its deep ruby color caused Victor Hugo to declare that Pommard is “Night in combat with day!” It offers aromas of blackberry, blueberry or even redcurrant, cherry pits and ripe plum. It may develop a more “savage” side with age. Then at full maturity, it tends towards leather, chocolate and pepper. This wine needs time to fully develop, to allow its smooth texture, delicate yet firm structure, fruitiness on the tongue and chewy tannins to come through, by which time it will be fully rounded out. This is a decidedly rich wine. 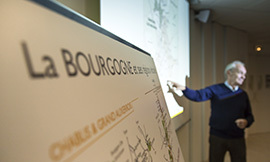 Discover the geographic and geological profile of the Pommard region with Jean-Pierre Renard, wine expert and official trainer at the École des Vins de Bourgogne. And the Pommard appellation as seen by Aubert Lefas, winemaker at Pommard. Bourgogne wines have a real cachet in Japan, a country whose culture, taste, and values correspond perfectly to those of the people of the Bourgogne region. In 2016, Japan maintained its place as the third leading export market for Bourgogne wines. In 2016, Bourgogne wines represented 17% of the total volume French AOCs exported to Japan, and 26% of revenue. Bourgogne wines have a real cachet in Japan, a country whose culture, taste, and values correspond perfectly to those of the people of the Bourgogne region. In 2016, Japan maintained its place as the third leading export market for Bourgogne wines in a context of a short-term lowering of imports of French AOC wines (down 6.6% over 2015). 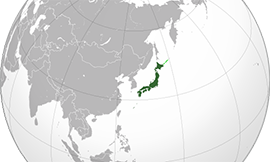 Economic growth in Japan remained stable in 2016, up 0.5%, underpinned by consumer spending and external trade. It should continue on this path in 2017, thanks to good exports and household consumption. In August 2016, the Japanese government introduced a new plan to relaunch the economy but the risks of deflation are limiting its potential. (Source: LE MOCI 2017). Mainland China is a very recent market for Bourgogne wines. Over the past decade, exports have undergone a tenfold increase, with red wines widely contributing to boosting sales of Bourgogne wines to China. 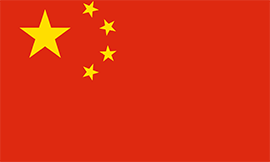 Key figures for 2016 exports of Bourgogne wines to China: The 11th biggest market in terms of revenue and volume. In 2016, Bourgogne wines represented 1.5% of the total volume of French AOCs exported to China, or 4.8% of revenue. China is a very recent market for Bourgogne wines. 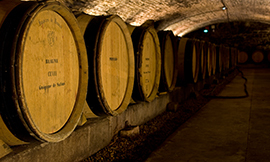 In 2007, it represented 0.2% of the volume of Bourgogne wine exported - some 234,000 bottles, accounting for 0.3% of revenue, equivalent to €2 million. In a decade, exports of Bourgogne wines to China have grown tenfold. Although dominated by French wines, the Chinese market is very open to wines from other countries and is the world’s fifth biggest wine importer. In 2016, China imported 6.4 million hectoliters of wine with a value of €2.14 billion. Don’t hesitate to call on our team of professionals if you’re organizing training seminars for your customers. The BIVB’s international network of Official Ambassadors includes 62 professionals who have been recruited and undergone extensive training in the region. They must then pass vigorous testing to obtain a diploma allowing them to operate as ambassadors for Bourgogne wines for a three-year period. The BIVB’s ambassadors are always up to speed with what is going on in the industry and regularly visit the region. They recently attended a three-day workshop to deepen their knowledge, studying themes including “Winegrowing and sustainable development in the Bourgogne winegrowing region”, “The influence of vintage on Bourgogne wines”, “Food and wine combinations”, and “The latest appellations of the Bourgogne winegrowing region”. All of this understanding feeds directly into the work they do. Our ambassadors are the representatives of the Bourgogne winegrowing region in the markets where they operate, passing on their knowledge to industry professionals and lovers of Bourgogne wines. They are there to help you organize your very own training sessions for your clients, so don’t hesitate to call on their expertise. That’s why the École des Vins de Bourgogne has come up with a three-day program to immerse visitors into this globally renowned event and take full advantage of this Bourgogne tradition. The packed program includes tasting classes, estate visits, cookery courses focusing on food and wine combinations, and in particular, a tasting of those wines that will be offered for sale at the auction on the Sunday. Participation in the auction itself is reserved for potential buyers, and the École des Vins de Bourgogne can help with access. This training module will be held in English and is by reservation only. 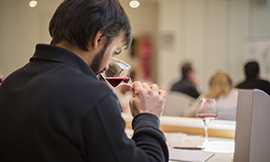 The BIVB invites you to take part in the Bourgogne Wines Professional Workshops in Beaune. The BIVB has designed this program of tasting seminars especially for sommeliers, winestore owners, restaurateurs, and buyers. With around 20 professionals per session, these workshops involve a fun and educational approach including guided tastings, landscape readings, lunchtime tastings on the theme of food and wine combinations, and visits to different estates and producers. Come and join us for this unique sensorial experience! Sign up quickly because the course is free and space is limited. The Bourgogne winegrowing region has an international reputation, being home to 100 different appellations. Some of these are less well-known than others, but each has all the characteristics of a great Bourgogne wine, with elegance, sophistication, and aromatic complexity. On 25 September in Brussels, the BIVB invites you to join in a masterclass and an extensive tasting dedicated to these appellations. This workshop has been designed for sommeliers, winestore owners, restaurateurs, journalists, and bloggers, and is hosted by Andy de Brower. It aims to lift the veil on these wines that are less well-known in the Belgian market, and will be followed by a wide-ranging, open tasting. Let yourself be seduced and surprised by the nuances and diversity of more than 30 wines from the BIVB’s Cave de Prestige that will be presented. If you’d like to take part and discover some of the hidden treasures of the Bourgogne region, contact Dimitri Riehl at dimitri.riehl@sopexa.com to book your place right now. After a very promising first edition, the VinoVision Paris trade show for cool climate wines will unveil a brand-new vintage on 12-14 February 2018 at the Paris-Porte de Versailles exhibition center. VinoVision is the professional trade show the Bourgogne winegrowing region was waiting for: Ideally located in Paris, easily accessible, and at a key moment of the year in terms of bringing wines to market. Bourgogne wines will feature strongly at this event that is specifically dedicated to cooler-climate wines. Sophisticated, lively, and elegant wines are all the rage, and Bourgogne wines epitomize this style, with distinguished whites, refined reds, and vibrant Crémant de Bourgognes. Across 10,000m² of floor space, around 500 exhibitors of cool-climate wines will be presenting some well-known appellations alongside those simply crying out to be discovered. This is a showcase not just for Bourgogne wines, but also those from Champagne, Alsace, the Loire Valley, the Beaujolais, and the Savoie, also showing at the event. 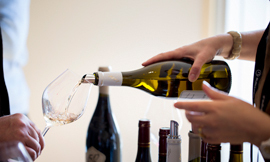 Producers of Bourgogne wines will be offering their wares for sampling at the event’s free tasting space. 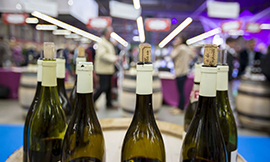 So, get the dates in your diary and join us from 12-14 February 2018 to discover the latest vintage from the Bourgogne winegrowing region at VinoVision Paris. In recent years, international training centers have become the benchmark in terms of wine training. Every year, the WSET, the Wine Scholar Guild, and the Society of Wine Educators train thousands of students, wine lovers, and future industry professionals. Naturally, the BIVB has formed partnerships with these prestigious centers to bring its support and expertise. Various formats have been developed to support these schools including themed Bourgogne wine sessions for more advanced students. This format, much lauded by the different institutes, has already been adopted in Canada, Hong Kong, Germany, and Switzerland, and will soon roll out to other territories. The BIVB is also setting up masterclasses with teachers in key territories. 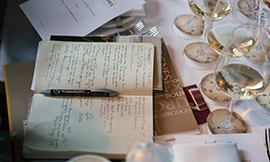 These sessions offer a real opportunity for communication with working groups and tastings, and ambassadors can easily get to grips with the world of Bourgogne wines and find the answers to their questions. This new format will enjoy a first session in Ontario, Canada, on 6 and 7 September. 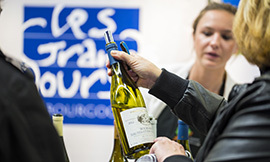 The dates of the 14th edition of Les Grands Jours de Bourgogne, the biggest trade event in the heart of the Bourgogne terroir, have been announced. Over the years, this unique event has become a key fixture in the calendar for tastemakers and journalists from across the world, who want to sample the appellations of the Bourgogne winegrowing region and meet the men and women who make them in the very heart of the terroir. The figures speak for themselves: The 2016 event welcomed 2,322 industry attendees, with more than 10,000 individual visits over the 14 different tasting areas. With favorite wines, opportunities to meet and greet, and plenty of appellations to discover, this is a moment that’s not to be missed, so get the dates in your diary today.